Since it had been 6 months since brewing and I had drained my stash of Heady Topper, I needed to brew something hoppy. I had a solid amount of Citra in the freezer just waiting to be used so I decided to make a hoppy american session ale for the first brew on the indoor induction brewery! The brew day was pretty solid for the first run on a new system and I tried to document some of it in this video below. I don't know if my enthusiasm showed through enough, but let me just say it was AWESOME being able to brew a batch of beer inside as it absolutely down poured rain all day outside. 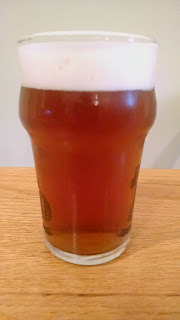 I made my first attempt at a hoppy session beer last year and then failed to document it on the blog - shame on me. In that attempt I took the Scottish 70 /- recipe from Brewing Classic Styles and threw a bunch of hops in it. I made it with maris otter LME for a quick extract batch during the mash of another beer for a two-brew, brew day. It ended up tasting okay and was a light-brown hazy ale, but just wasn't what I was looking for. Too much malt character and the hopping ended up being too Citra forward (had 3 oz in the dry hop) - if that is possible. Taking the previous attempt into account I decided to lean more towards a grain bill I would use in a pale ale, but upped the crystal malt %. I used Weyermann Caramunich I (~35 lovibond) because I purchased five pounds of it in a bulk buy, but I think using Crystal 40 could achieve very similar results in the future. I like to have a little crystal malt as I think the sweetness it imparts pairs nicely with Citra hops. Also having a less fermentable grain is pretty crucial in keeping these low gravity hop bombs in check. I rounded out the recipe with some Munich malt for character and more equal parts of Simcoe and Cascade to prevent the Citra from being overpowering. I present inTROduction - an American Session ale. A play on words for my innagural brew on the induction system. Appearance: This American session ale pours dark amber in color with good, but brilliant clarity. It has a frothy just off-white head with great retention and good lacing. Flavor: Moderately high hop flavor of tropical fruit with low citrus notes. There is a herbal-spice character I often notice with centennial that I detect, but need to figure out a better way of describing. Moderately low caramel malt sweetness. Moderately-high hop bitterness. Finishes slightly dry. Balance is moderately hop forward and bitter. Overall: This was a refreshing hoppy session beer, however, at the time I finally got around to writing down my tasting notes it was a shell of what it was fresh. Alas, that's what happens to all hoppy beers over time. Citra is still the dominant hop in this attempt, but the other hops add necessary complexity too keep this beer from being too one dimensional. I liked the way this came out and I think in the future I may mash a little higher to increase the body a smidge. additionally I may use a lower lovibond crystal malt which shouldn't impart as much caramel sweetness, but retain the body I am looking for. Why did you dry hop Centennial instead of Cascade? Glad to hear that! Thank you for updating!